WASHINGTON (Reuters) - The reddish cigar-shaped object called 'Oumuamua spotted last year tumbling through space is a comet, scientists said on Wednesday, solving the mystery over how to classify the first interstellar object found passing through our solar system. Astronomers said they closely examined the trajectory of 'Oumuamua, which measures about a half-mile (800 meters) long, as it speeds through our cosmic neighborhood after being evicted somehow from a distant star system. They found that it is deviating slightly from a path that would be explained purely by the Sun's gravitational pull because of what apparently is a very small emission of gas from its surface, indicative of a comet. 'Oumuamua (pronounced oh-MOO-uh-MOO-uh) initially was pegged as a comet, but it lacks the tail of gas and dust characteristic of many comets, and some scientists argued that it was perhaps a dry asteroid. "It does not display any tail in any observation we obtained," said astronomer Marco Micheli of the European Space Agency's SSA-NEO Coordination Centre in Italy, who led the study, published in the journal Nature. "However, our analysis shows that the amount of emitted gas that is needed to generate this extra force we see would have been so small as to be invisible in our observations," he said in an email. This "extra force" acting on the object's trajectory amounts to only about 0.1 percent of the Sun's gravitational attraction. 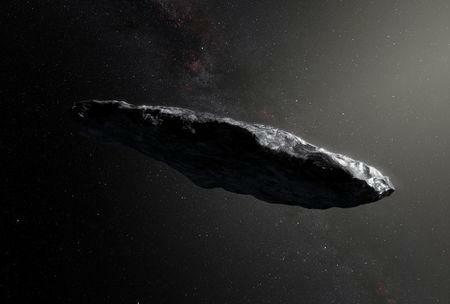 'Oumuamua was first detected last October by the University of Hawaii's Pan-STARRS1 telescope. Its name refers in the native Hawaiian language to a messenger arriving from a great distance. It previously slingshot past the Sun traveling at roughly 196,000 miles per hour (315,000 km per hour) and is heading out of the solar system in the direction of the constellation Pegasus. 'Oumuamua as of last month was roughly the same distance from the Sun as Jupiter. "The discovery of 'Oumuamua is an absolute first in the field, and it provided our first opportunity to study an object coming from another star and planetary system," Micheli said. "The existence of these objects was expected, but seeing one for the first time, and being able to study it in detail, is a unique chance to know more on these distant systems, and how they formed."